Very recently the Allen Array Telescope has been put into operation. One of its important tasks will be to search for other civilisations. On 11 October 2007, the University of California at Berkeley and the SETI Institute announced that the first 42 radio dishes of the Allen Telescope Array (ATA) had been activated. The Telescope is dedicated to Paul G Allen the co-founder of Microsoft. Planning for the telescope began in 2001. Eventually 350 radio dishes will be installed. The full 350-dish array, when completed in approximately three years, will have unprecedented research capabilities. ATA opens the doors to a new era of scientific progress. The telescope’s potential discoveries include a better understanding of exploding stars (supernovas), black holes, and new, exotic astronomical objects that are predicted but not yet observed. It will also provide expanded search capabilities to determine if intelligent civilizations have evolved around other stars. The ATA is the first panchromatic, wide-angle, snapshot, radio camera ever built. It is the most effective tool to create radio images of a vast area of the sky ever placed in the hands of researchers. While making innovative observations for radio astronomy, it can simultaneously interrogate solar-type stars for artificially produced signals that would reveal the presence of extraterrestrial intelligence. The University of California at Berkeley and the SETI Institute announced that the first 42 radio dishes of the Allen Telescope Array (ATA) had been activated. and collecting scientific data from the far reaches of the universe. This is the first phase of a planned 350 radio dishes that will advance the capabilities of radio astronomy research. Paul G. Allen, Microsoft co-founder and philanthropist whose foundation donated seed money that started the project in 2001, joined representatives of UC Berkeley and the SETI Institute to launch the array. (In 2001 Paul Allen agreed to fund the technology development and first phase of construction. In October 2007 the array began commissioning tests and initial observations.) The Allen Radio Telescope is a radio interferometer in development in Northern California, roughly 290 miles north east of San Francisco at the Hat Creek Radio Observatory. It is jointly managed UC Berkeley Radio Astronomy Club and the SETI Institute. 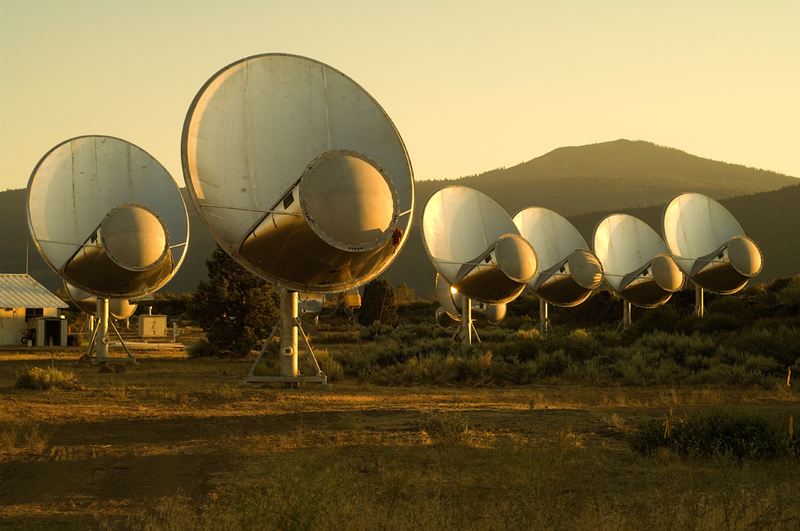 A close up of six of the dishes of the Allen Array is shown on the left above. At the moment there are only 42 dishes in operation. Eventually there will be 350 giving a huge range in the search for other civilisations. The Array is situated at The Hat Creek Radio Observatory in northern California. Full instructions as to how to get there from the UC Berkeley Campus are given in the SETI website.